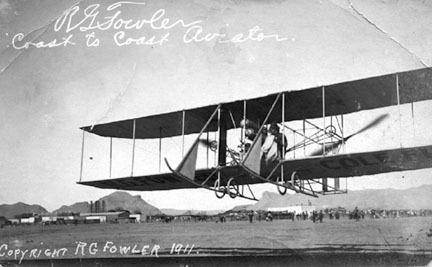 Although edged out by Cal Rodgers' historic first crossing of our nation by air, Robert Grant Fowler's reverse path was none the less a pioneering effort. A first attempt from San Francisco at the Hearst prize of $50,000 for the first to cross the USA by airplane began on Sept 11, 1911, but ended in the Sierra Nevada when a spark plug wire came loose the next day, stopped his engine, and forced a crash into the trees. His Wright B was a wash-out, Fowler fortunately walked away with minor injuries and his ambition in tact. Upon acquiring sponsor J J Cole, president of Cole Automobile Company in Indianapolis, a second try at the eastward flight was made, but from Los Angeles instead, favoring the less mountainous southern route for his rebuilt Wright Cole Flier. In late afternoon of Oct 19, he set off from Wiltshire Field, but only made it as far as Pasadena before darkness took over. The next day was betterhe made the 60-mile leg to Riverside. It was slow going because of winds, and replacement of an engine that blew up over Banning Pass only added to the snail's pace. It took Fowler eight days just to cross Arizona Territory, and when he reached New Mexico Territory on Nov 4, he learned that Rodgers had just crossed the California state line. Undaunted, and despite that the time limit for the Hearst Prize had expired, he pressed on. After repairs to gear damage from landing in sagebrush and cactus near the Mexican border, he found it impossible to take-off on the sandy soil, and it looked like he would be stranded at the desolate spot. However, ingenuity came into play when he located a handcar on a spur track. He and his ground crew, with help from railroad workers, fashioned a platform on the handcar from which Cole Flier could be launched. On Nov 13, this was placed on the main track, the Wright was cranked up, and off he went at a creep, slowly picking up speed, soon outdistancing his crew running alongside. Not yet airborne, the sight of smoke ahead told of an oncoming Santa Fe train, and it was a bizarre thought that he later related: "I was going to be the first pilot to crash into a locomotive!" Luck held, however, and the Wright lurched off its deck in time to clear the smokestack "by ten feet" as the handcar was reduced to splinters. Texas required a whole month to conquer its 1,000-mile width, and despite more hardships and attrition, with bulldoglike persistence he continued to wend his way through Mississippi, Alabama, and Georgia into 1912, finally landing at Jacksonville on Feb 8 as the first to fly coast-to-coast west-to-east. It had taken him 45 days to fly some 2,800 miles into the history books!